It takes abut 30 minutes for me to travel into London on the train and I tend to go into the city once or twice a month, but yesterday was different from my normal trips so I thought I’d share it with you. 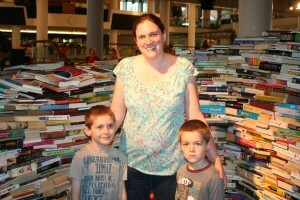 Our first stop was the Southbank Centre where they have constructed a maze using 250,000 books. The maze isn’t particularly big or complicated, but my boys loved seeing the walls of books. Reading the ones on the top layer is encouraged and it was lovely to see so many people talking about books and recommending them to their friends. There were even shorter walls packed with books for children – if you’re in the area it is worth popping in for half an hour. Outside the Southbank Centre they are building a lego map of the world. 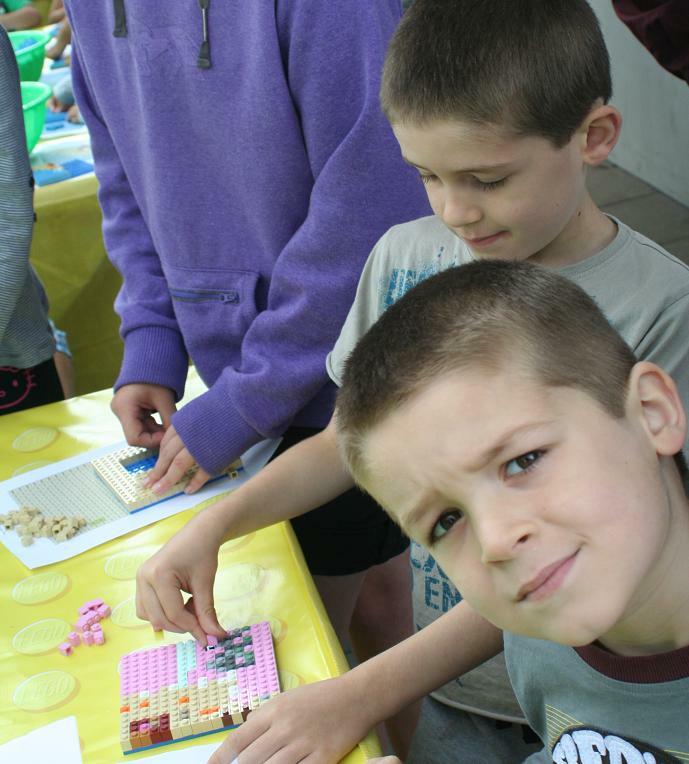 Children are encouraged to build a square and then place it amongst the others. 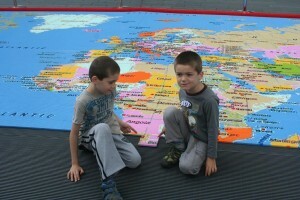 Here are my boys finishing their square and then placing it with the others on the world map. You can help to build the map between 12 and 4pm for the next few days and the completed map will be on display for a further 2 weeks. 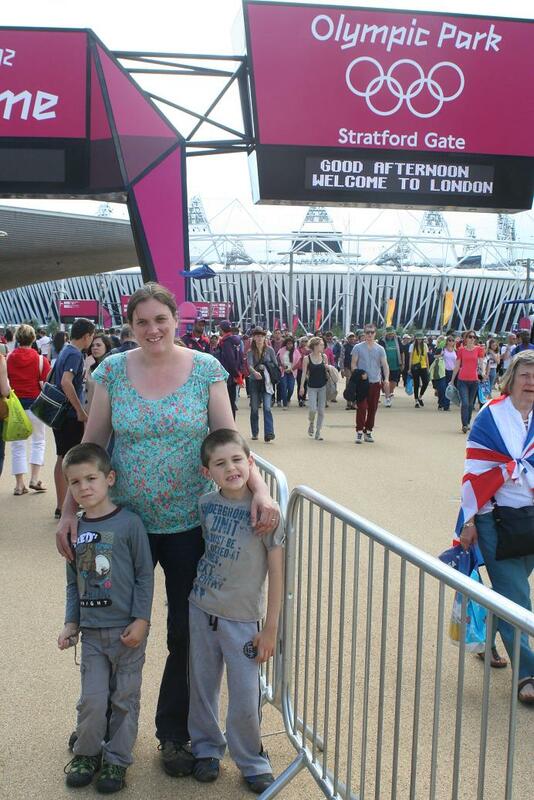 We then braved the crowds at the Olympic Park. The atmosphere was amazing and I was really impressed with the organisation – there weren’t even queues to get on the trains. I have never seen London so clean and crowds of people so happy. I hope that the excitement and happiness continues after the Games have finished. London is a fantastic place to be at the moment! Stu, I love any time spent in London too. I hope the positive effects of the Olympics continues after the athletes have gone home. I have never been to a city with Olympics. That would be so cool. And the maze and the map look cool too. Sounds like a very productive day in town for you! Jackie, these are great photos and looks like day of such fun for all of you. Thanks for sharing. Glad to hear it’s not a crazy place right now. An ideal place to live – only a short trip from London! Harvee, Yes – everything is so well organised. I’m so proud of London. I don’t know what other readers think, but I always like it when you throw in something personal into the blog. It’s a reminder that there is someone other than just a blogger behind the name. Someone with kids, a life and feelings!!! Michael, my 13 year old, gave me a telling off for “talking to someone online whom I do not know” !!! (i.e., you):) (I have spent so much time teaching my kids the dangers of communicating with people online). So, thanks for sharing the personal stuff. I was in London on the 23rd July ( after 12 years!!!) I’m back in Spain now, but I agree….. it was so CLEAN! Buildings, streets and all. I loved it. Before the actual Olympics , but great vibe all the same. I’m sure you had loads of fun. 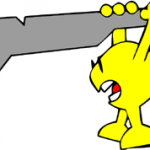 Ifi, I have always struggled with the personal stuff. For the first few years I avoided it altogether, but I’ve now realised that people like to see a bit. I can’t work out the right balance as I know non-bookish stuff bores some people. I’ll continue to throw in the odd post and I’m pleased that you enjoyed this one. I think your son would be horrified by what I’ve done in the past. I’ve not only talked to people online, but met lots of people too. I’ve met lots of amazing people and had a fantastic time, but I think it is good to teach your son about the dangers. Hopefully he’ll stop telling you of for talking to me soon though! Yes, I can imagine you must have struggled with the personal stuff. Very brave. The balance seems just right to me though. 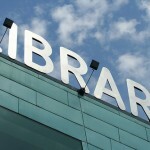 I love this blog as you know and you always manage to include something new of interest . You introduced me to the Giller Prize and Waterstones 11.Love both! The only annoying thing is that I always seem to be reading something different at the time of your reviews so can never engage in “proper discussion”. Grrr. Sorry that we never seem to read the same books. You can see which ones I’m planning to read in my sidebar or if there is a book you’d really like to read with me just let me know. I’d be happy to read something together so we can have a proper discussion. Golly,( I don’t say that in real life) Thank you. I know, your side bar, but you are always 5 steps ahead of me. Although I DO see “The Memory Of Skin”. Can’t remember why it is on my TBR pile … but will read it now. Ifi, Great! I look forward to comparing notes with you. That sounds like such a fun day out! 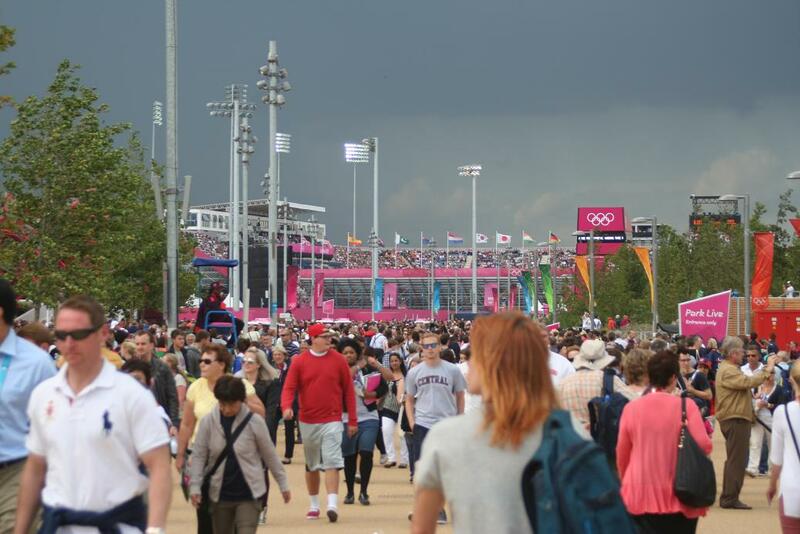 I am happy to see that Brits are going to the Olympic park to enjoy it. I was so impressed with the transportation, volunteers, and everything about my experience at the Olympics last week! I wish I had known about the book maze and the build-a-map; I would totally have gone there! Helen, I forgot to mention the volunteers – they were fabulous! So helpful and friendly. It is amazing to think they are giving up so much time for free. Glad you had a fabulous time at the Olympics too! What a lovely day. My daughter and I are having a day in London this Friday and we’re going to Madame Tussauds (which despite me being a Sarf Lunduner I’ve never been to), and then to see Wicked in the evening. (There’s a kids go free in August offer on at many West End & other London Theatres) so we got best seats at effectively half price. Despite only being an hour away, I only go to London a few times a year, but I always enjoy it, and having gone to Imperial College, I do like being back on home turf. Sadly we won’t have time this trip to fit in a visit to either the Olympic Park (did you have entry tickets, or can you just turn up?) or the Southbank Centre, but you obviously had a lovely day. Annabel, I saw the kids go free offer for the theatres and it looks great – we are thinking of taking them to see Shrek later in the month. I hope you enjoy Wicked! We went to Madame Tussauds last year, but it was all a bit lost on my children as they had no idea who any of the people were! I’m sure your daughter will appreciate it a bit more because she is older. Sorry to hear that you wont be able to make it to the Olympics – yes you do need tickets which you have to get online in advance. It costs £10 just to get in to the Park. Wish I’d been able to see some of the events, but it is great to see it all on the TV too. I loved seeing this post with your family – looks like a great day out! Verity, I’ll try to include a few more photos in the coming months – glad you liked them! My friend told me about that wall of books in Southbank and I’m thinking whether I should go or not! Though I live in London, I live far West, so going to Southbank is actually quite a trip away (about an hour). The Olympic Park is a great idea too. I didn’t get any tickets, but just going there and soaking in the atmosphere might be just as fun? mee, I’m not sure it is worth an hours journey, but is interesting if you can combine it with something else. Our train gets into Waterloo so it wasn’t far off route for us. I’m afraid you need tickets just to get into the Olypic Park – it is well worth going, but you’ll need to keep refreshing the ticket website http://www.tickets.london2012.com/browse in the hope of getting some. How fun! I had seen pictures of the book maze, but you are the first person I’ve heard of that has had the chance to walk it. Nicole, I first heard about the book maze when they were on twitter looking for volunteers to help build it. I wasn’t able to make it on those days, but I’m glad I went to look at the completed thing – I wish there were more walls of books around! That is fascinating. I know that things like this have to get made somehow, but I would have thought professionals or some sort of specialized skills were necessary. But I’m sure once a plan is in place all you need is organization and volunteers. 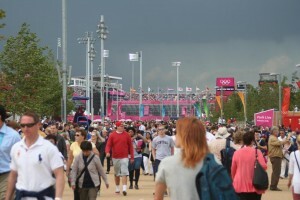 I can’t believe you braved a trip to the Olympic Park — I would have thought it would be too packed to visit — so very cool! Although I most envy the book maze — so cute! Audra, It was packed, but there were no queues – it was so well organised. I’m pleased I went. Sounds like a fun day out, Jackie! I used to live approx. 30 mins from London but rarely went as the city is no attraction to me at all. But these sort of outings I would have loved to do! Really nice. Judith, I love visiting London – I find so much to do. Where did you live when you were in England? I lived in Brighton (under London) and in Colchester (above it), both for about 5 years each. I’m just not a big-city person. I’ve only just started to appreciate Amsterdam a bit, and that’s mainly for the beautiful old houses near the canals. Did you say we need tickets to get in the Olympics park? OH dear, we wanted to go this weekend. How much does it costs? There seems to be no more tickets. Jo, Tickets to the Olympic Park cost £10 each, but I think you might be right about there being no tickets left any more. You’ll need to keep refreshing the ticket website http://www.tickets.london2012.com/browse in the hope of getting some. Good luck! Oh, my two would love that – books and lego too! We will have a trip to London at some stage but it will require quite a lot of organisation (flights, accomodation etc). Perhaps after we have made our first trip to Legoland, Windsor which we always mean to do. I saw something on Facebook about the maze of books – that is so neat that you got to see it in person! Hi Jackie, that’s a lovely post. I would really like to try and see the book maze whilst it’s still there, especially as it’s to do with Oxfam. I have just been finally finishing my own blog post about a day at the Olympics. I loved it from start to finish. I don’t get to London as often as I used to but I still love to go. I don’t often blog about things that aren’t book related but it’s nice to see different things that people have been doing.